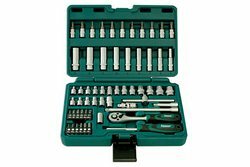 The 1/4″drive set features 9 deep sockets, 13 standard metric sockets, 6 Star sockets, 8 Star bits, 3 hex bits, 12 assorted screwdriver bits, a universal joint, 50mm extension bar, 150mm extension bar, sliding T-bar and screwdriver. All three socket sets have been designed and manufactured to last, and if and when the ratchet starts to wear, the mechanism can be replaced quickly and easily with spare parts readily available. Supplied in a sturdy storage case these are useful and versatile sets that offer professional quality at a very affordable price. An ideal set for anyone wanting to increase their their socket set collection. A great small tool kit to compliment any tool collection.